Easy-fill 12-gallon detergent solution tank. Quick-Dump 12-gallon recovery tank. The powerful 100 psi solution pump delivers a steady supply of extracting solution to the carpet. Dual high-velocity vacuum motors with over 160-in. of lift. Powerful water pickup gives faster carpet drying. Motor stays cooler with innovative air flow design. 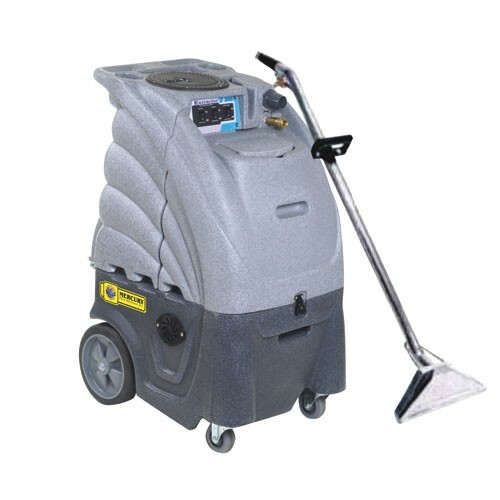 25-ft. vacuum and solution hosesclean 600 sq. ft. without moving the extractor. Semi-pneumatic 10-in. transport wheels for easy stair climbing. Convenient waist-height controls. Strong, two-piece steel wand with 9-in. vacuum head and single spray jet. Manufacturer's five-year warranty on chassis, two-year on pumps and vacuum motors and one-year on pump and tools. Shpg. wt. 114-lbs.